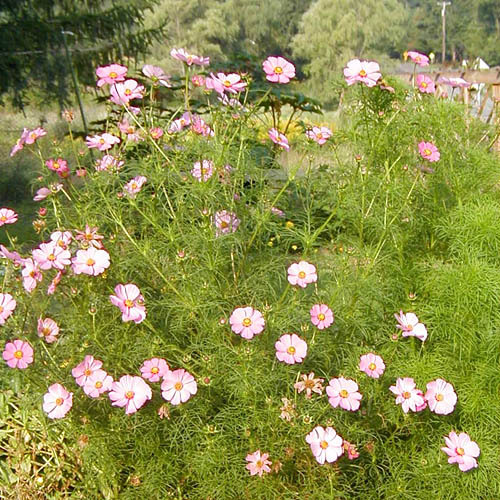 A tall annual that fills space rapidly, Cosmos is renowned for its profuse blooms and generous self-seeding habit. Perfect for providing large splashes of pastel color in the garden. Does not do well in rich soil, becoming leggy and weak. Prefers neutral to alkaline pH and warm weather. Flowers from July until frost. Hybrids are available in many different shades of these basic colors, mostly pastels. Propagate by seed - Scatter seeds outdoors where desired after frost danger has passed, or start indoors 4 to 6 weeks before the last frost. The plants self seed prolifically. May require staking. May be weedy due to self seeding. Deadhead to prolong flowering. Look for dwarfs, various flower colors and plant heights. �Cosmic� Series: Short (1� tall) plants with colorful yellow or orange flowers. Very reliable bloomer. �Sonata� Series: large flowers in shades of pink, white and red on short, 1 to 2� tall dwarf plants. 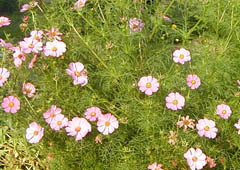 Does very well in full sun, and flowers abundantly. �Candy Stripe Mix�: white flowers striped along the length of the petals with shades of red. �Daydream�: pale pink petals deepend to dark pink towards the tufted yellow center of the flower. Very striking. �Gazebo Mix�: white pink and red flowers are larger than most Cosmos and showy on 3 to 4� tall plants. �Seashells Mix�: trumpet-like flower petals are rolled into tubes. Flowers in shades of pink, red and white. Plants grow 3' tall. �Sensation� Series: very large (4 to 6') flowers in a variety of shades of pink, white and red. Plants grow to 4� tall. �Versailles� Series: excellent for cut flowers because of its wiry stems and large, colorful blooms in shades of red, white and pink. Blooms during short days, and thus is a good winter greenhouse cutflower plant. �Picotee' attractive white flowers have reddish pink edges with faint red lines running the length of the petals and yellow flower centers.